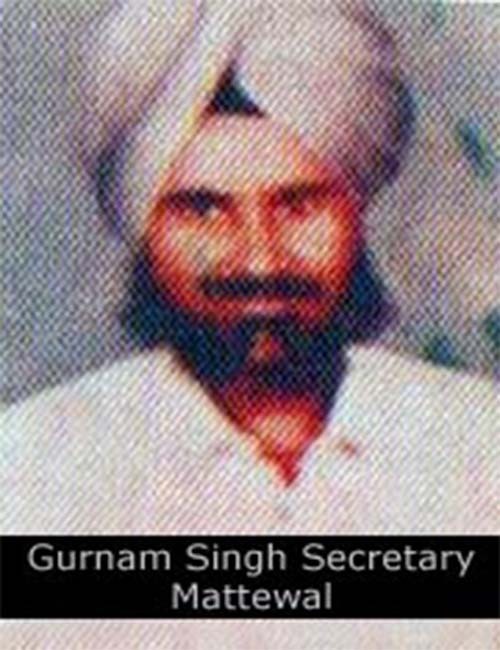 In amongst the Jhujaroo Singh’s of the Dasmesh Regiment who attained Shaheedi in the Sikh Struggle was Bhai Gurnam Singh Secretary Mattewal. Bhai Sahib was born in the family of Sardar Teja Singh, from the womb of Mama Chint Kaur in 1956, in the village of Mattewal, area Baba Bakala, district Amritsar. Bhai Sahib’s elder brother was Khuzan Singh and younger brother was Daya Singh. Bhai Sahib received his primary education from the local school in Mattewal and for further education he went to Khalsa School in Sitiala. Bhai Sahib was married to Bibi Prakash Kaur. Bhai Sahib had two sons the elder Sukhdev Singh suffered from polio and the younger one was Harpreet Singh. Bhai Sahib worked as the farming society secretary, he fulfilled his duties with all honesty. After 1984 Bhai Sahib left his job and joined in the Sikh struggle with Shaheed Bhai Seetal Singh and Shaheed Bhai Tarsem Singh. From the 10th of September until the 12th for a continuous 36 hours there was a fierce battle between the Jhujaroo Singh’s and Indian Forces C.R.P and B.S.F in the Sugarcane fields at Bulowali. The Jhujaroo Singh’s shot the enemy down, the remaining officers ran out of the fields screaming. It was in this battle that Bhai Gurnam Singh along with his companions Bhai Seetal Singh, Bhai Tarsem Singh, Bhai Gurdial Singh Mari Panua, Bhai Gurmukh Singh Bugga alias Gambhir Singh Sita all attained Shaheedi in the battlefield. The Sikh Kaum of the Jhujaroo Singh’s. veyard near Amritsar Gurdwara Shaheedan. The Sikh Sangat travelled on buses and trucks and flowed the ashes in the river at Kartarpur Sahib. An Akhand Paath and final Ardaas was done in the fields where the Singh’s had attained Shaheedi. The Sikh Sangat arrived in thousands and paid their tributes. 12 Sep 1991-The Bolowali encounter is the encounter between 5 Khalistani FreedomFighters and 12,000 Indian Armed Force.